Fall festivities are coming to the Meadery! Looking for a way to kick off the Halloween weekend? 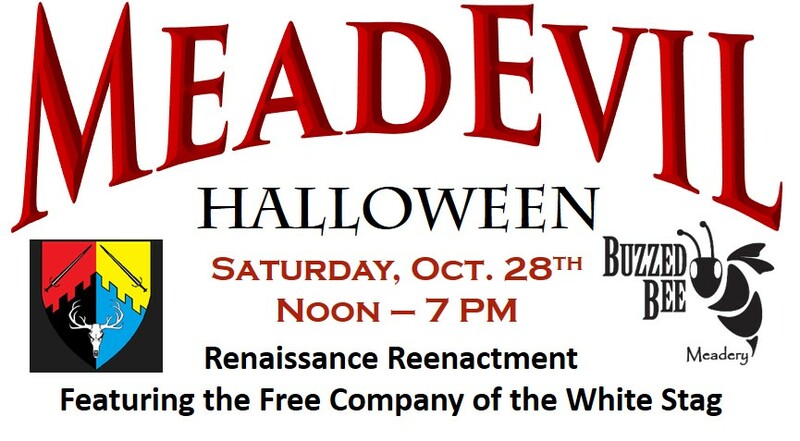 Join us at the Meadery for a MeadEvil Halloween. We are thrilled to have the Free Company of the White Stag join us for a fun filled day. There will be sword fighting, kids activities and opportunities to learn about the organization. Families are welcome, however you must be 21 to enjoy the mead. From 12-3 PM the Flying Elbow Food Truck will be on site with lots of yummy lunch options. I happen to be looking forward to some Mac N'Cheese or maybe a Nacho Man dog. Then November 4th & 5th the Heart of Iowa Wine Trail is hosting a Food & Wine Pairing event. Advance tickets are required and the event is limited so get your tickets prior to Nov. 2nd. Cost is $15 per person which allows for three food and wine pairings at 9 locations around central Iowa. We are still finalizing our tasting menu but we know it will be a great event with lots of tasty bites.